Order of service from the meeting of the South Middlesex Federation of Young People’s Religious Unions at the First Congregational Unitarian Church, Bedford, Mass., May 7, 1905. This drawing was on the cover of a brochure for a townwide old house tour on Saturday, October 4, 1952 from 11 A.M. to 5 P.M. The event included an “Afternoon Tea with Old-Fashioned Cookies” served in the Church Parlor and was sponsored by First Parish Church. 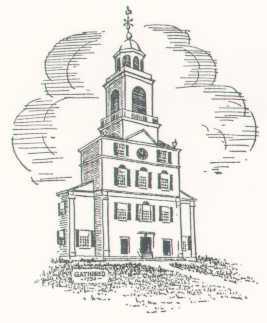 The First Parish of Bedford is proud of its historic Steeple Clock.